The Roman surveying texts which tend to be quoted by most Historians or Roman” enthusiasts,” are those by HYGINUS GROMATICUS. But, there may have been two or three such named persons. By analyzing extracts from the writings, it is possible to indicate that ‘they’ may not have been surveyors. This paper examines two well known extracts. The extracts have been deliberately quoted from Professor Dilke’s book, rather than the original translations, thus retaining the discussion element contained within that text. It is very pertinent to the conclusions of this paper. To find the cardinal points of the compass, a ‘gnomon’, a scribed circle on the ground and several small sticks are required. Place the Gnomon upright in the ground. Using the gnomon as a centre point, with a string radius of known length, scribe a circle on the ground. In Britain this can be a 20 pedes radius. The sun will cast a shadow to the west in the morning, swinging via north at midday and to the east in the afternoon. By careful watching it can be established when the shadow line crosses the scribed circle in the west before midday, and, later when it crosses the scribed circle again towards the east. For real accuracy, the shadow line can be followed upon the ground and the maximum distance from the gnomon noted. That will actually be ‘Due North’. But the actual confirmation line is found by joining the two marked crossing points. That line will be ‘Due East/West’, and by simple geometry the ‘North/South’ line established, which should confirm the maximum shadow north point. Thus the Roman Surveyors established the Cardinal Points across their domain. Are either of the quoted statements really practical; does the inference which can be drawn from each, indicate a trained surveyor or a theoretician writing these two texts? If we study the second extract first, a miniature diagram and text from the MS. A . [Wolfenbuttel], we see that the author is indicating in a very dramatic way the fact that a ‘surveyor’ must look at the surrounding landscape; that the ‘surveyor’ must ascertain the angular altitude of any obstruction to the sun’s rays. However, to assess the actual effect on the ‘Gnomon or Groma’, and the shadow it throws, the radius of the scribed circle upon the ground, must be determined. As already indicated it is this circle which determines the actual alignment of the cardinal points. The shadow length cast by the ‘gnomon’ is a direct result of the sun’s altitude in the sky. Provided two points, which coincidentally will be equi -timed about midday, are used, there will be enough information to determine the cardinal points. But the accuracy of alignment is not assured. 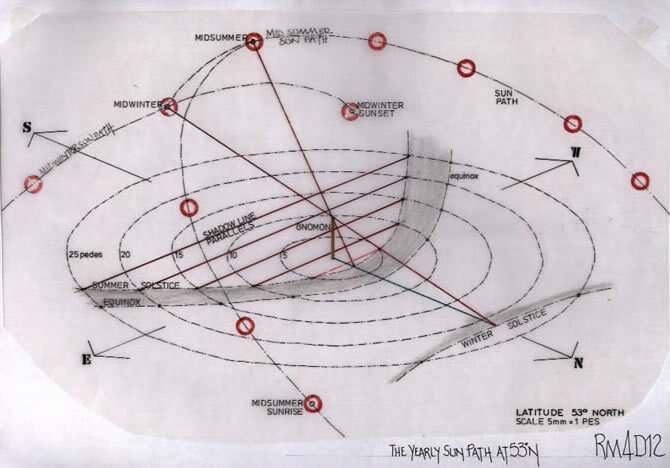 Hence a surveyor, who is provided with a simple table of angles and radii, using a gnomon of known height, (5 pedes in the examples used throughout this paper,) can soon ascertain if the sun’s path will be compromised. The 5 pedes height was chosen because it is part of the standard measures of ‘Rome’, the Passum, and it is in all probability the standard mounting height for the ‘Groma’, or ‘portable sun-dial.’ [Dilke, 1971, p72]. It will be obvious that the taller the gnomon, the longer the shadow line, the greater the circle required to enable the shadow line to cut its circumference. But, the sun’s height in the sky varies enormously across the Roman Empire. 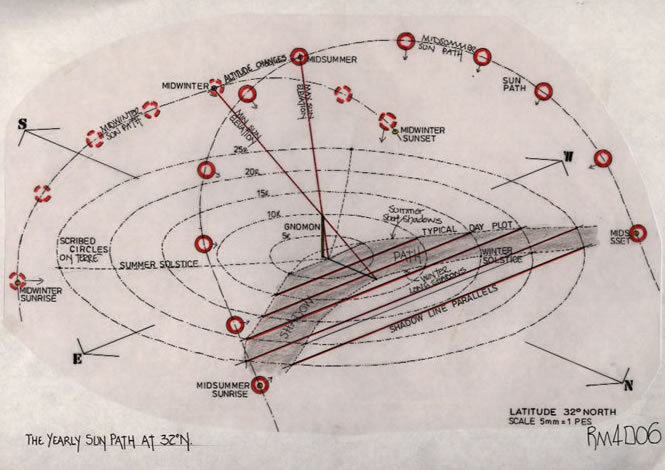 If the Gnomon for our mountain zone example is situated 5 centuriae from the foot of a ‘mons’, and a circle of 20 pedes is utilised, then the sun must attain an angle or altitude above the horizon of 14 degrees rising and 166 degrees setting. [ ie., 14 after rise and 14 before set]. Thus the 14 degrees is used to form a triangle whose base line is the 5 Centuriae or 12,000 pedes, and the height of the sun at that point can be calculated. The mathematical calculations are, 12,000 x Tan14 or 12,000 x 0.25 = 3,000 pedes. That equates to an altitude of 887.5 metres for the Sun. Thus rising vertically at the point after the 5th centuriae, 3.55KM.,the ‘mons’ would require to be over 887.5 metres in height to block the sun’s rays. The verticality is of course nonsensical. It would not happen. Therefore if a ‘mons’ commenced at the 5th centuriae point, i.e., land was short and they were building , or farming as close as possible to the base, because of it’s slope side ,a ‘mons’ could in fact be considerably higher as the peak was further away. It could be very far away, and is only determined by the point where the projected 14 degree line meets the actual peak. Therefore, it is hard to rationalize in survey terms the instructions given , particularly when a ‘mons’ of over 900 metres would have been more than self evident to a Roman Surveyor. If we study a map of Italy where ‘Centuriation’ is known to exist [Dilke, 1971, p143], it is shown basically paralleling the ‘Via Amelia’. This is north east Italy, but we can establish from any current map that it is only when we approach the most northerly areas that a ‘mons’ range has the height to cause concern. 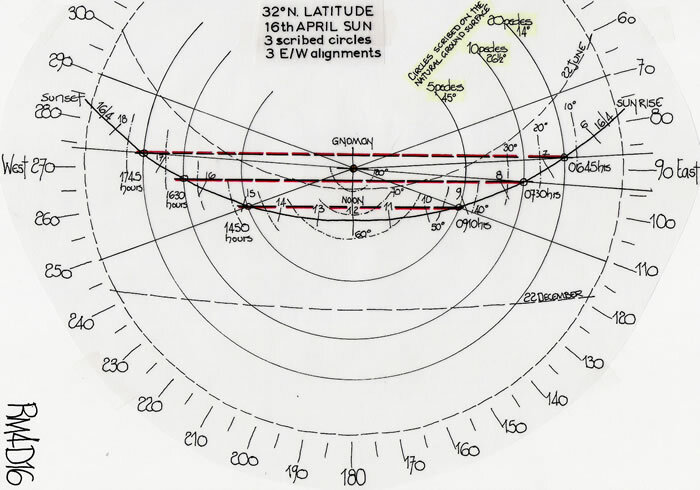 It is only here that it is likely a surveyor may have sun and shadow line problems. It is highly unlikely that this” mountain” or small valley area of land would have been a candidate for ‘centuriation’ in Roman times. It is more likely to have been cattle or sheep grazing land. It is therefore highly unlikely that the text and diagram in the MS A [Wolfenbuttel] manuscript were written by a practicing surveyor. The instructions are not couched in survey terms, regarding distance and elevation. It appears that they were written by a theorist with little practical experience. By illustrating an unlikely problem, with such a dubious example, a lack of experience is indicated. 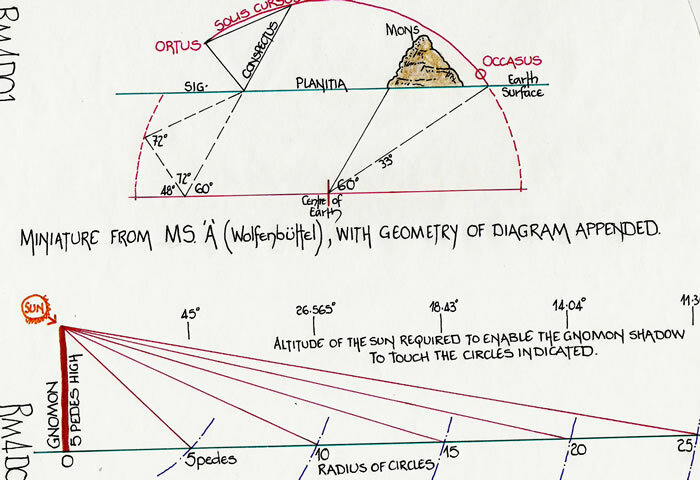 Having used the second quotation to introduce the utilisation of the sun’s altitude, and the gnomons shadow falling across a scribed circle to find the cardinal points, the first quotation, noted as by Hyginus Gromaticus, can now be assessed. The Roman Empire in 100AD, had lands from North Africa to North Britain. But, the sun’s path through the sky varies considerably as the latitudes increase over these diverse countries. North Africa is 32N; Rome is 42N; Britannia south is 52N and Hadrian’s Wall is 55N. The Tunisian, Libyan and Egyptian littorals occupied by Rome may fairly be represented by the 32N latitude. Thus we may utilize one sun path diagram for illustrative purposes. The sun path for 32N is indicated upon diagram 3; at midday the solar altitude varies from 35 degrees at the winter solstice [22/12] to a maximum altitude of 81 degrees at the summer solstice, on the 26th June. The day length varies from 07:00 to 1700 hours on 22/12, to, 05:00 to 1900 on 26/6. Hence, the Roman Hour would vary from 50 minutes to 1 hour and 10 minutes i.e. 50 to 70 minutes maintaining a 12 hour day. Simple triangulation of the gnomon height and the sun’s altitude for the maximum and minimum positions indicates the circle size appropriate to determine the cardinal points. Thus a gnomon formed by a pole, 5 pedes in height, at the Solstice’s, produces only a minor length of line for the accuracy required. They will be of little use if an extension of over 12,000 pedes was required. Thus it would be probable a gnomon of 10 pedes, a decempeda would be required for adequate shadows. This length is a standard measuring pole used by the Roman Agrimensors. If Diagram Rm4D05 is studied, the solar chart for 32N, it has appended the ground scribed circles of 10 and 20 pedes radii. We have already seen that a 5 pedes gnomon with a 20 pedes circle requires a sun altitude of at least 14 degrees for the shadow to cross the circle. Diagrams Rm4D06 and Rm4D07 indicate not only the length of line that can be achieved for the start of a survey, but also the HOUR that the shadow crosses the circles. The shadow of a 5 pedes gnomon crosses a 20 pedes circle line at 06.00 and 18.00 hours. This is so obviously at variance with Hyginus Gromaticus’ statements. But, were they nonsensical? The calculation of the actual length of line which would appear upon the ground from shadow point to shadow point, forming a chord to the circle, is simply, 2 x 20 x Sin70 or 37.59 pedes. The figure 700 is the angular shift of the sun either side of due south. Thus the line produced at c37.5 pedes is 1/64th of a Centuria and long enough for an accurate extension by sighting marks to commence a land survey. But, it must be re-iterated that the observation hours are 06.00 and 18.00, not midday. 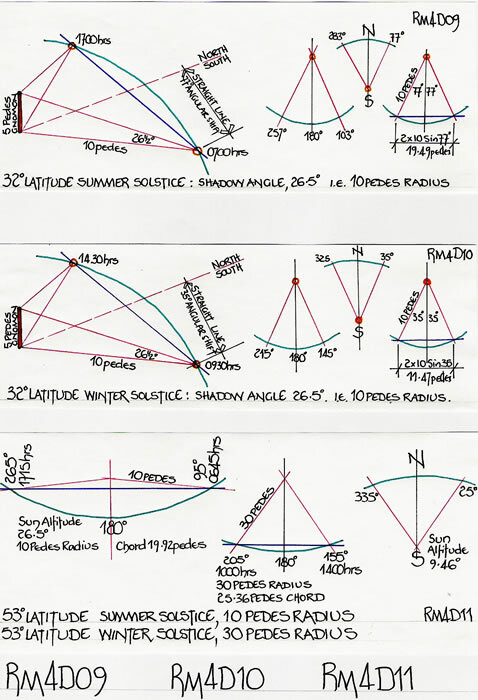 If we now study the solar parameters for a winter survey, and the length of line which can be achieved by a 20 pedes circle, as Diagram Rm4D08 illustrates, we will be able to assess by interpolation the length of line available throughout the year. At the winter solstice the angular shift is 50 degrees, and a line of 30.642 pedes is produced at the observation hours, 08.15 and 15.45. This line is c1/78th of a centuria, and long enough for an accurate extension. Again though, the hours are incompatible with the original premise. 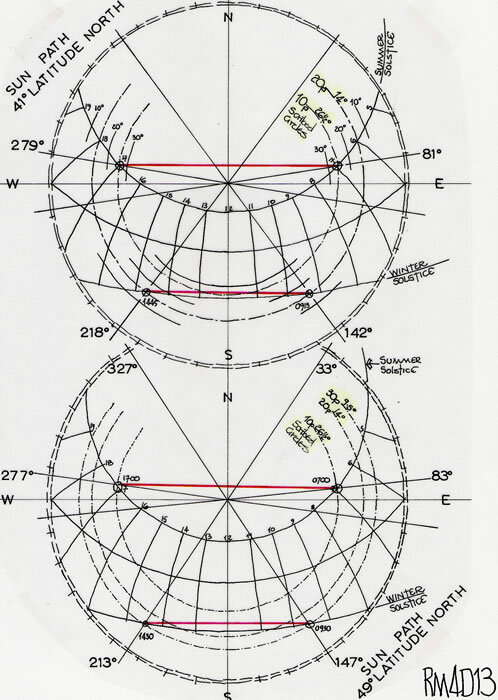 Hence, with a 5 pedes gnomon and a 20 pedes circle at Latitude 32N, a line varying from c30 to c37 pedes is quite possible to achieve as a survey master line, but, the records of the marker points must be made in both instances within one hour of sunrise and sunset. This is hardly the equivalent of ‘the mid point of the sun’s appearance’ required by Hyginus Gromaticus. Diagrams Rm4D09 and Rm4D10 illustrate the points. To fairly test the statement just quoted, it is necessary to find a survey line closer to midday. That can only be achieved, given the sun’s solar altitudes, by reducing the circle radius to 10 pedes. Thus, in diagrams 9 and 10 we see that the length of line is reduced to 19.49 pedes, or c1/123rd of a centuria. This expansion rate is outside accuracy requirements and probably would not be accepted. But, the observation hours are still at 07.00 and 17.00 hours for the winter solstice. At the summer solstice the length of line is reduced to 11.47 pedes or 1/209th of a centuria. This is quite unacceptable, even though the observation hours are slightly improved to 09.30 and 14.30 hours. From the preceding text and diagrams it can be seen that during the months from the spring to autumn equinox, a circle radius of 15 or 20 pedes would be required to obtain an east/west alignment of sufficient length for expansion as the Kardo Maximus. The observation hours, between 06.00 and 07.30 in the morning with 16.30 to 18.00 hours in the evening, equate to 1 and 1.5 hours from sunrise and sunset. Was Hyginus Gromaticus unaware of the North African Colonia? This is the mid latitude, the Chester /Lincoln line and has been chosen solely for illustrative purposes. The sun’s maximum angle at the summer solstice is c60 degrees altitude, and at the winter solstice it is c13 degrees altitude. Therefore the circle radii will vary quite markedly either side of the equinoxes, to provide a line of sufficient length for survey purposes. Diagrams Rm4D11 and Rm4D12 illustrates circles varying from 5 to 30 pedes radius. At the summer solstice, utilizing a radius of 10 pedes, there is a chord length of 19.92 Pedes. This is similar to the 32N example, and verges on the unacceptable, but is an example of the minimum that may be seen. The observation hours are 06.45 and 17.15 hours. At the winter solstice, utilizing a radius of 30 pedes, we produce a line or chord of 25.36 pedes, or 1/95th of a centuria. But the observations must be made at 10.00 and 14.00 hours. A 40 pedes circle would produce a length of 51.42 pedes, a rather good c1/46th centuria, observed at 09.00 and 15.00 hours. 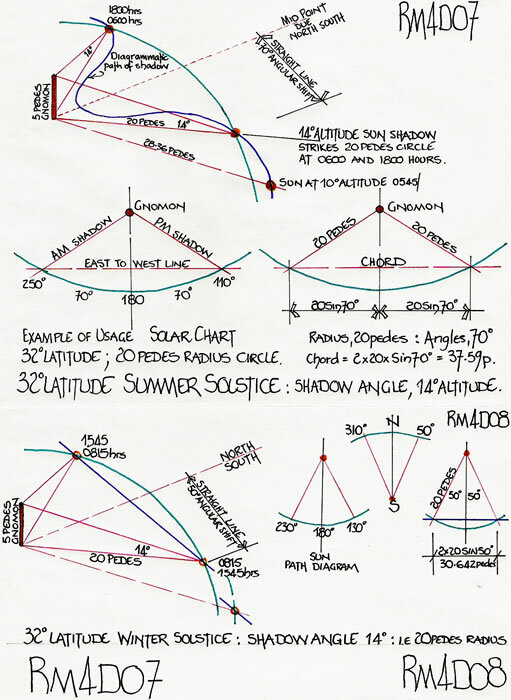 Diagrams Rm4D13 and Rm4D14 illustrate the solar charts for Latitudes 41N, 49N, 53N and 55N with scribed circle lines varying from 10 to 30 pedes radius. Study of those diagrams will illustrate, that to obtain a line of sufficient length to ensure accurate expansion to just one centuria, the observation times must be near to sunrise and sunset, when the shadows are at their longest. At or around midday, the sun’s shadow is at its shortest, thus, there is the greater chance of inaccuracy when extending a line by 100 times its original length. The possible inaccuracy is easily established. If we examine a line or chord of 20 pedes length, the limit of accuracy at 1/120th of a centuria, there are two possible error points. Firstly we must mark the two shadow points against the scribed circle on the ground, the natural surface. Constant observation is required to ascertain the exact moment the shadow touches the line. Thus if we assume a mere ¼ uncia deviation at each end of the chord, as Diagram Rm4D15 illustrates, there is a simple triangle and a 1;480 deviation. Thus over 2400 pedes, one centuria, the deviation is already 5 pedes out of true line. But this nominal original error or deviation of ¼ uncia, is in surveying terms an acceptable error, and would be considered accurate enough. Thus, as with modern construction, there is an in-built error, an unavoidable error given the tools available. The shadow point, as it crosses the scribed circle, may have been cast by the top of a ‘groma’ post c¾ uncia square, as the ‘Pompeii Groma’ indicates. The shadow must touch or cross a knifed or similar mark on the natural surface. Thus another variable is introduced. Given that the ‘Agrimensor’ had to use a position dictated by another person or persons,’ He’ had to walk onto a plot of land, with soil of whatever composition ,and ,after preparatory work erect the Gnomon and scribe the circle[s]. The resultant mark would vary considerably, from a clean incision in damp sandy soil, to a ragged mark in quite crumbly soil. The top of the ‘groma’ post at 22mm produces probably the least acceptable shadow mark. Any smaller and the ‘umbra/penumbra’ effect of shadow creep tends to diminish the shadow’s size and intensity, thus making a clear observation nearly impossible. If a larger post diameter is utilised then the geometry of the shadow cast would affect the reading against the scribed line by more than the ¼ uncia described. 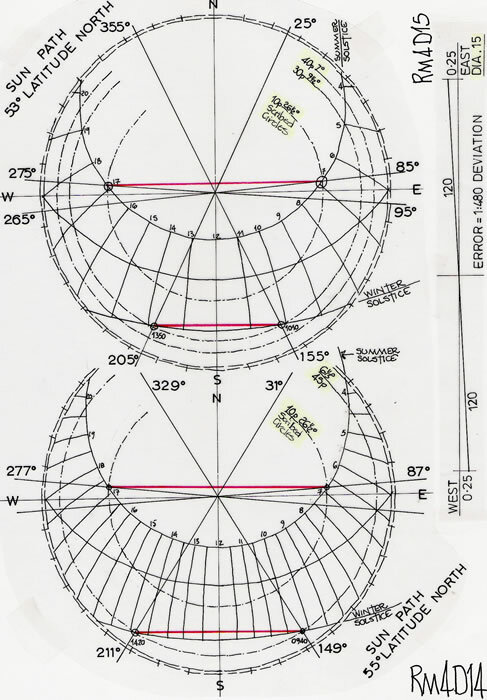 These observations are from field trials of a 5 pedes pole with caps of varying diameters, from 6 to 63mm, carried out on a sunlit day. The experimentation also indicated that a light coloured piece of cloth placed adjacent to the scribed line assists with accuracy. This is even more important upon a grass surface. No doubt the ‘Agrimensors’ had many ‘knacks’ of the trade which were handed down through the fraternity. 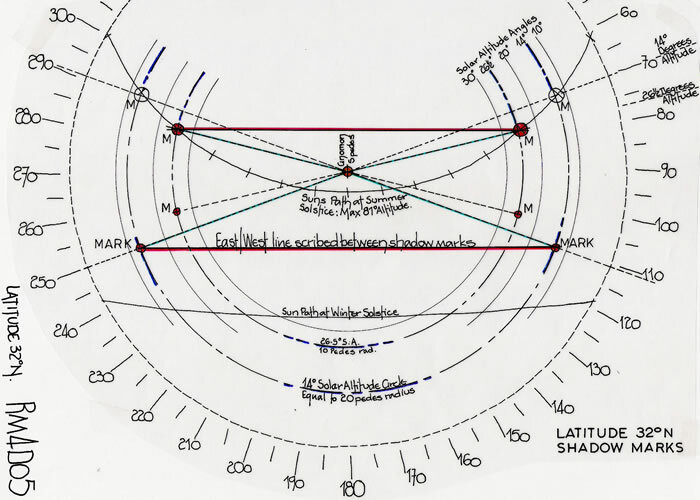 If we review diagram 3, latitude 32N, and consider the average sun path line, e.g. 16th April, we can illustrate very simply, the accuracy which can be obtained at ‘no cost,’ in time or energy. It just requires the application of survey training. Diagram 16 illustrates how easy it is to produce the check line or lines for the Kardo Maximus, and thereby increase the accuracy to near perfect observation. There are three circles scribed at 5 , 10 & 20 pedes radii, which at that latitude require an ‘Agrimensor’ to be available for observations from c06.45 to 09.15 and 14.45 to 17.45 hours. But of course the after noon observations could be first, followed by morning observations the following day. The ‘Agrimensor’ then has the whole day to complete the initial setting out. But, there are also three lines which have been scribed upon the ground. These should be three parallel lines, and thus the accuracy can be checked for and adjusted as necessary. We have the single comment from Hyginus Gromaticus concerning a check on the Quintarius. But what are they checking against. Any inaccuracy is already in-built. A dimensional or square check is a natural feature of any survey. The Surveyors task at Latitude 32N would have been considerably easier than at latitude 53N, with its lack of sunlight and short winter days. Varying techniques would be required, and these do not always make an appearance in text books. It must be very clear to all that the statement ‘mid- point of the sun’s appearance’ would not provide for accuracy or practicality in terms of normal survey procedure. The radius of the circle required to obtain a reasonable length of chord line is far more important. But, this varies considerably with the time of year and latitude of the chosen site. At 32N, a circle 20 pedes radius provides a reasonable line length, and in some circumstances a line of 15 or even 10 pedes may work. However those would be at the extremes of accuracy. At 42N, Rome, it is a circle of 20 pedes that could suffice for a yearly record. The winter length is 24.6 pedes and near the limit. If a 30 pedes circle was chosen, a line length of 43 pedes would be achieved. At 53N, a 30 pedes circle produces a line length of 25 pedes, and a 40 pedes circle, a length of chord at 50 pedes. 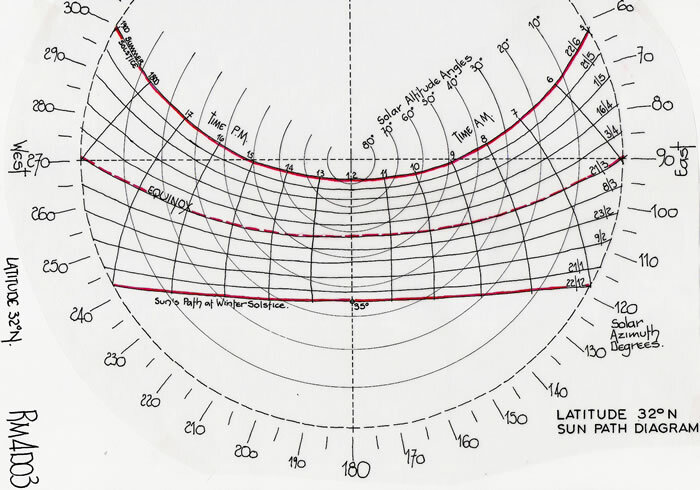 Thus the prime statement to a surveyor working across the Roman Empire, should not be’ the mid point of the sun’s appearance’, but “Ensure that your circles are of sufficient radius for the countries Latitude”, and “Have regard for the Latitudinal shift of the sun altitude”. In terms of G M T, the closest survey time to mid day we have noted is 10.00 and 14.00 hours. 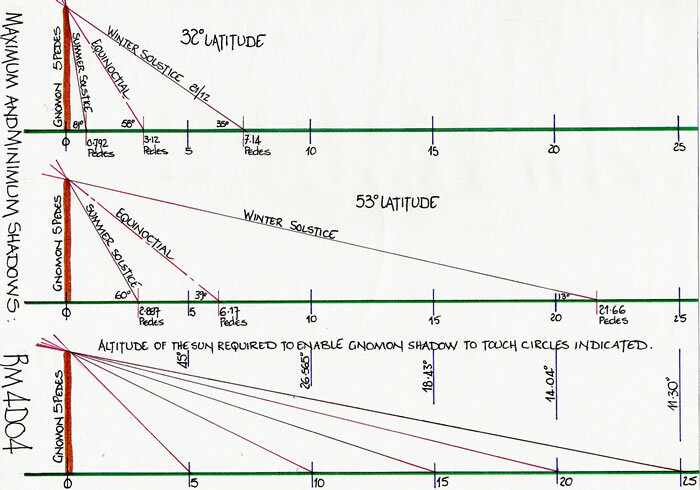 In general we have seen that the most appropriate chord line length for survey accuracy is given by observing the shadow points within 2 hours of sunrise and sunset. And, that also gives the best use of available time. If we consider the Army on the march, moving from camp to camp, the surveyor required to use other tricks of the trade to align the camps properly. The surveyor/engineer would have been in the vanguard of the column, thus ensuring ‘He’ could direct the initial setting out of the camp. The sun would have been observed, and direction of marching known. Arriving generally before noon, ie., after a three hour march, there would have been ample time to set up a gnomon and circle for the accuracy required. On the march, a simple check with the ‘groma’ pole would establish the varying height of the sun, and mid day pin-pointed. Therefore an afternoon arrival would be anticipated and the ‘north’ point already discerned on the march. Thus the text by Hyginus Gromaticus, however many there were of ‘him’, should be read with some degree of scepticism. They are a guide, perhaps theoretical discussions, but certainly not particularly practical for a surveyor at the sharp end! 1) SURVEYING AND SURVEY ACCURACYExtract from “Land Surveying” by Ramsay J P Wilson, M & E Handbooks; 1971, Page 22. Thus we must be very careful not to ascribe to the Roman Surveyors a level of accuracy that is not achievable. We constantly read comments regarding how accurate the Romans were. In fact, unless we know the precise survey markers that were used, we just do not know what accuracy was achieved. We must not compare the Centuriation of land, where the subdivision was the ACTI of 120 pedes, with a distance of even a Roman Mile of 5000 pedes. In the Roman mile there are just less than 42 Actus, and the proportionate error is the same. We can estimate the level of accuracy vis a vis the Antonine Itinerary, Mile Posts etc., but, they do indicate deficiencies in the measurements, which vary quite considerably. Thus we must apply common sense to the landscape dimensions we now find, apply survey error factors and above all note that repetitive dimensions would not have been built as the nearly correct whole Roman Mile units we calculate from the O S co-ordinates. They would have been whole units. “At the height of their empire ( 27BCE to 476BCE) , the Romans often stubbornly used 25/8 for PI, even though they clearly knew 22/7 was closer; because an eighth ( a half of a half of a half) was much easier for their legions to work with. In fact, one Roman treatise on the subject of surveying contains the following instructions for squaring a circle; ‘ Divide the circumference of a circle into four parts and make one part the side of a square; this square will be equal in area to the circle’. Extract from “The Joy of PI, by David Blatner, 1997, Penguin Books. Dilke O A W, 1992, ‘Insights in the corpus Agrimensorum into surveying Methods and Mapping’, V & R in Gottingen. Dilke O A W, 1971, ‘The Roman land Surveyors’. David and Charles; Newton Abbot. The Classical Quarterly, Vol, XLV, number 2 1995. The Journal of Roman Studies, Vol. LXXXVI 1996. Ferrar M J & Richardson A, ‘The Roman Survey of Britain’, BAR, British Series, 359, 2003.